Crude Connections is a new online resource that reveals how BP’s business strategy extends from the British Museum’s latest blockbuster exhibition, Scythians: Warriors of Ancient Siberia, through meetings with ministers in Westminster, all the way to Putin’s right-hand man. This page gives a detailed timeline of BP’s meetings with minister and lobbying of government departments featuring new FOI material. US and EU sanctions, introduced in response to the Russian annexation of Crimea, have put limits on the projects BP is able to undertake in Russia. This particularly relates to BP’s 19.75% stake in Russian state oil company, Rosneft. For more information on BP and its close collaboration with Rosneft, click here. Through a series of Freedom of Information requests, we have obtained material revealing how BP works in close partnership with the UK government, looking for loopholes and workarounds to the sanctions regime. We have also uncovered details of how the Department for International Trade – set up in response to the Brexit vote – is actually working against the spirit of sanctions and pursuing even greater UK involvement in the Russian oil and gas sector. The Department for Business, Energy and Industrial Strategy and the Foreign and Commonwealth Office responded to our FOI requests but with significant redactions, the former only after an internal review of the original request. Despite holding material relating to its communications with the Russian Embassy/State, the Department for Digital, Culture, Media and Sport has argued that this material is exempt from disclosure. It raises questions about the nature and scale of support being offered to BP in order for the company to have been ‘hugely grateful’. 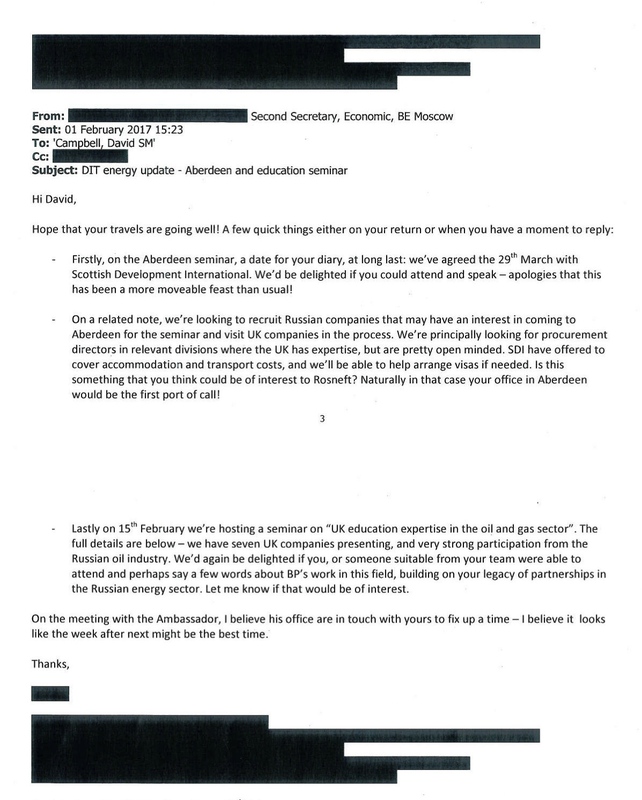 Click here to view the original email disclosed under FOI. 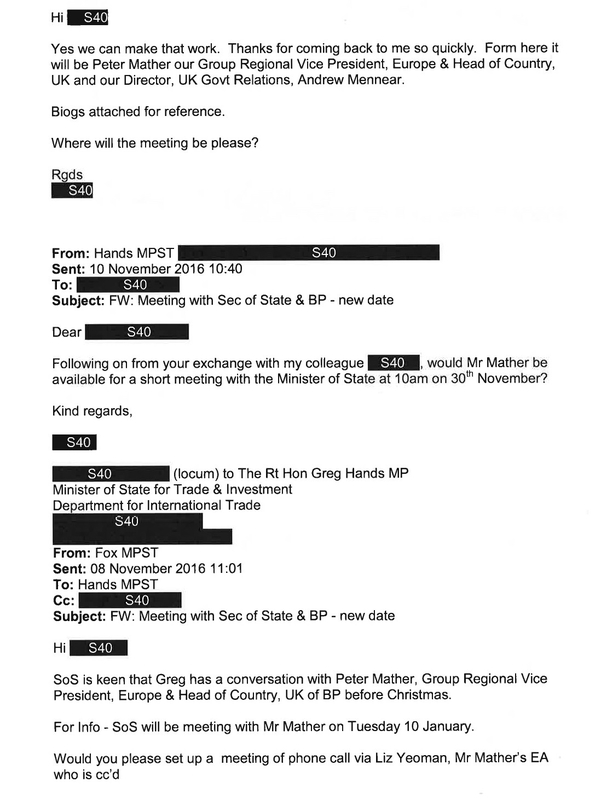 ‘…keen that Greg has a conversation with Peter Mather of BP…before Christmas’. A meeting is held between high-level BP staff and the Secretary of State for International Trade Liam Fox MP, his personal secretary and the Department for International Trade’s Head of Energy. What is significant are the extensive redactions that have been made to the meeting notes. 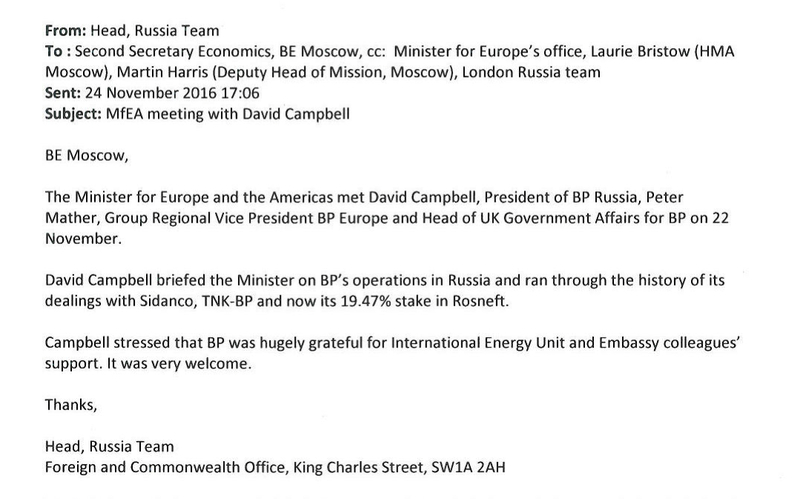 Given that this meeting took place on the 10th January – just months before the Department held a workshop on ‘How to break into the Russian oil and gas sector’ – it is likely that this might also have been on the agenda, as well as BP’s wider interests in Russia. Liam Fox also makes reference to an ‘over the line’ initiative, notifying businesses about when ministers are planning overseas trips. A few days before this meeting, the DIT attempted to set up an additional meeting between the BP delegation and the department’s Director of Energy Campbell Keir, to take place shortly before the meeting with Liam Fox. Campbell Keir was a Country Director for Shell for 7 years before being seconded to the UK government. 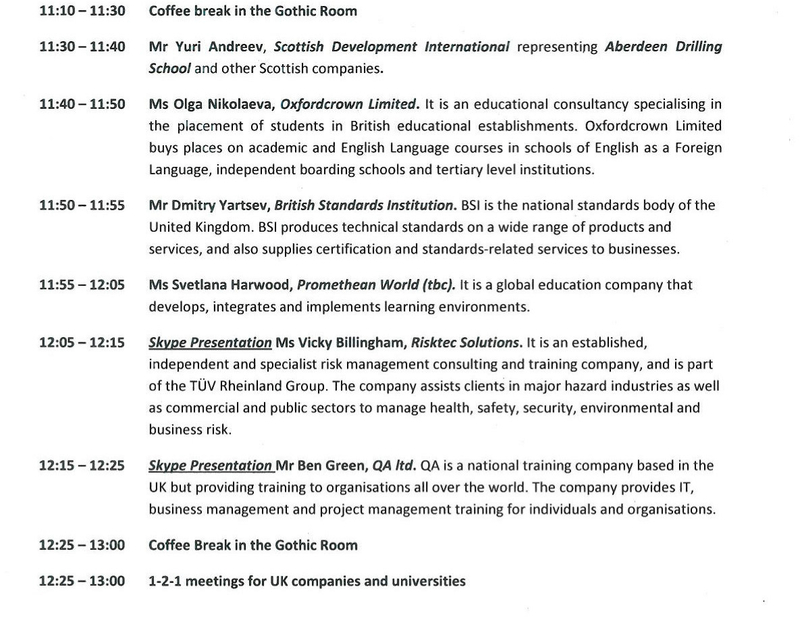 The British Embassy in Russia hosts a ‘Seminar on Vocation and Professional Education in the Oil and Gas Sector’, designed to strengthen collaboration on ‘UK and Russia education companies, schools and universities in one of the key industries – oil and gas’. Tellingly, President of BP Russia David Campbell gives the opening remarks at the event, a clear recognition of how deeply BP is embedded in the Russian oil and gas sector. The day also featured a presentation from Risktec Solutions, ‘a specialist risk management consulting company’ that ‘assists clients in major hazard industries’. BP is one of its many clients. The lack of reference to the limits sanctions are supposed to place on UK-Russia oil and gas collaboration as well as the broader imperative to decarbonise in line with the Paris Climate Agreement is telling. 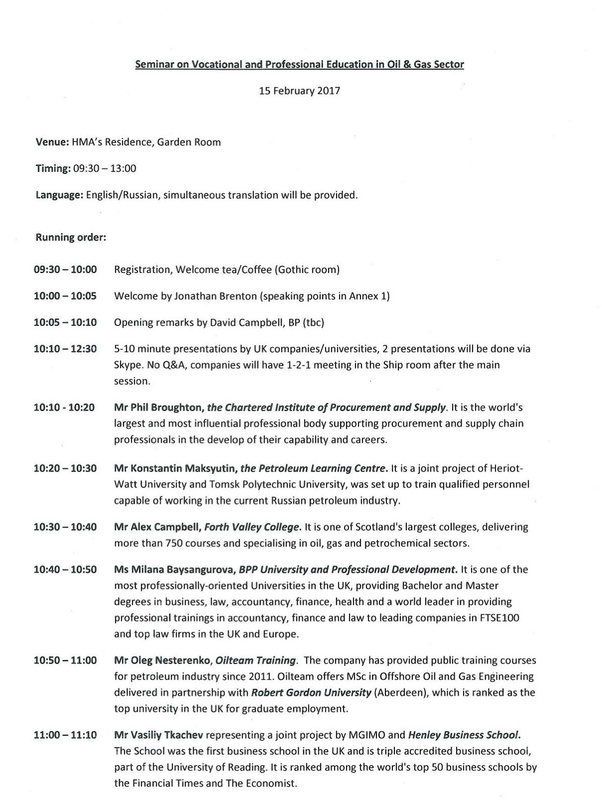 See the email sent to BP Russia about the event here. See the page 1 of the event timetable here and page 2 here. Following Russia’s illegal annexation of Crimea in 2014 and its recent meddling in Western elections, the UK government has been openly critical of the Putin regime. But despite its public commitment to continued economic sanctions targeting the Russian oil industry and curtailing British companies’ involvement in it, as well as its rhetoric on the need to reduce dependency on Russian gas, in private the UK government has hosted events intended to have the opposite effect of strengthening British involvement in the Russian fossil fuel industry, often with BP’s active involvement. In this instance, the DIT hosted a one-day workshop for small and medium-sized companies, designed to support them in ‘breaking into the Russian oil and gas sector’. The publicity, below, makes the case for why Russia is such a desirable economy to break into, pointing out that ‘maintaining oil and gas production in Russia requires large scale use of new technologies, which largely are not restricted by sanctions’, and offering legal advice on sanctions and ‘the best routes to the market’. A month earlier, BP was invited to speak at the event, as well as take part in one-to-one meetings with other UK companies. BP was also asked ‘if this is something you think could be of interest to Rosneft?’, an implicit acknowledgment of the close collaboration between the two companies. The one-day workshop included also included presentations by other Russian companies and associations. View the email to the President of BP Russia inviting him and giving details of the workshop here. View the email giving details of a delegation attending from Russia, below. The Russian Ambassador was invited to a series of events at the British Museum related to the BP-sponsored Scythians: Warriors of Ancient Siberia’ exhibition where members of BP staff would be present. Prior to the formal press launch of the exhibition, BP took the opportunity to meet privately with the Russian Ambassador, the Museum Director and Chair of Trustees. The email from the British Museum inviting the Ambassador to attend is below. 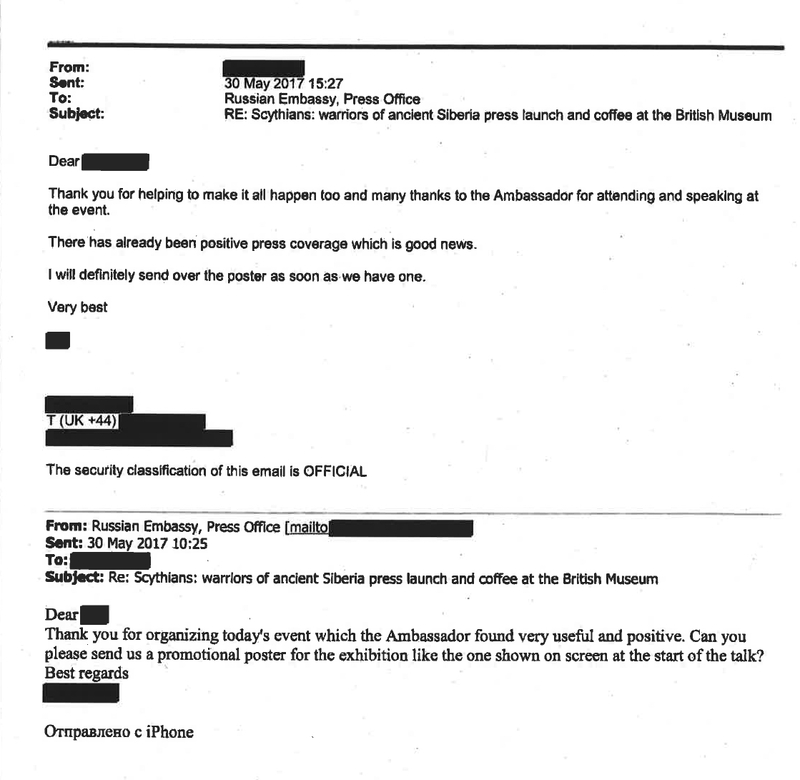 You can also view follow-up emails between the British Museum and the Russian Embassy, where the Ambassador described the event as ‘very useful and positive’, here. St Petersburg International Economic Forum (SPIEF) is an annual business event for the economic sector in Russia, hosted since 1997 and with the backing of President Putin since 2005. BP has used the forum as a public platform for announcing several major joint ventures with Rosneft over the years, as well as signing oil and gas agreements. This announcement was made despite fracking – the primary technique used to extract gas from ‘hard to recover’ reserves – being supposedly off-limits for EU companies in Russia under the current sanctions regime. The British Embassy proactively set up a meeting for its Ambassador with BP CEO Bob Dudley on the margins of the SPIEF event. Bob Dudley and others at BP are often publicly equivocal about the company’s relationship with Rosneft, as they know many investors are uncomfortable with such close ties to the Russian state as well as Rosneft’s poor safety record (see our section on Rosneft). But to the Ambassador, Dudley candidly describes relations with Rosneft as ‘strong’ and that ‘business in Russia is good’. 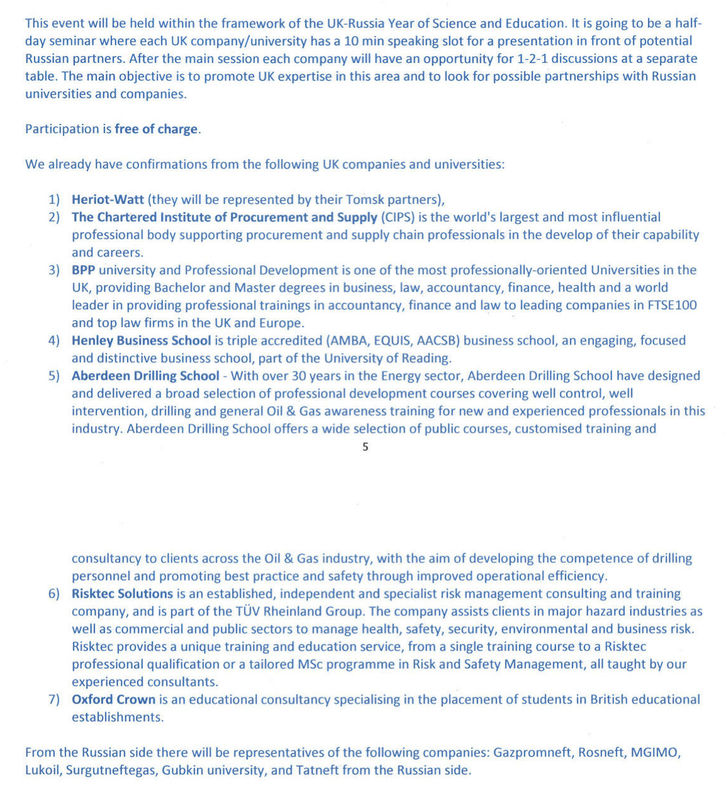 View the email to BP Russia’s President setting up the meeting here. In his reply, David Campbell says, ‘I know Bob [Dudley] will look forward to it’. A brief report of the meeting, sent to the British Ambassador by the Second Secretary at the British Embassy, is below. Following alleged Russian state interference in US elections, the US sets out a fresh sanctions bill. BP and other oil companies quickly raise concerns about the potential impact on their business activities, and start mobilising to lobby against the bill. Two days after the new US sanctions are announced, the British Embassy in Russia emails BP to discuss ‘what this could mean for UK interests’. 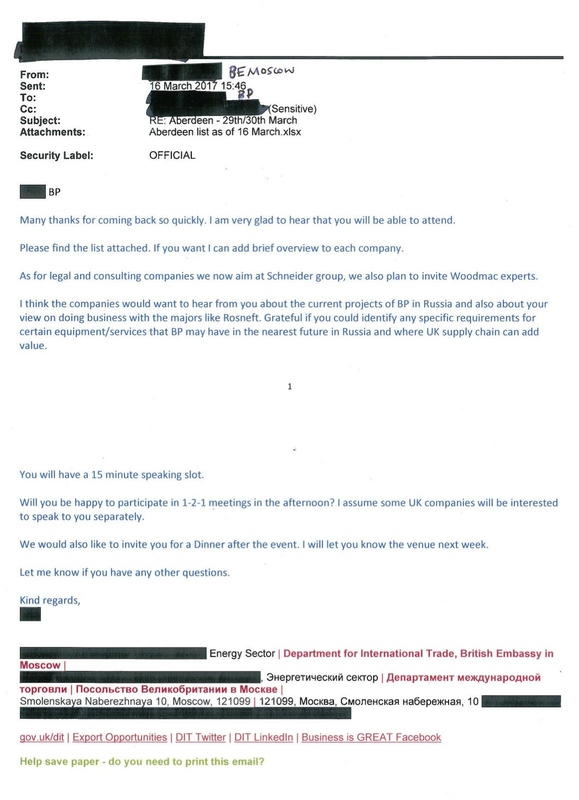 Just three days later, the Second Secretary at the British Embassy in Russia reports in an email – with the subject ‘US Sanctions amendment – BP initial views’ – that they met with BP’s lawyer in Russia. While no further information about that meeting has been disclosed by the FCO, we know that the email was sent to the British Ambassador in Moscow, the Deputy Head of Mission and the British Embassy in Washington. This meeting was likely part of a concerted lobbying campaign by BP and many other industries in the US to water down the new sanctions bill. While other oil companies continue to express concerns about the impact of the bill on their operations, BP’s particular needs seem to have been met. 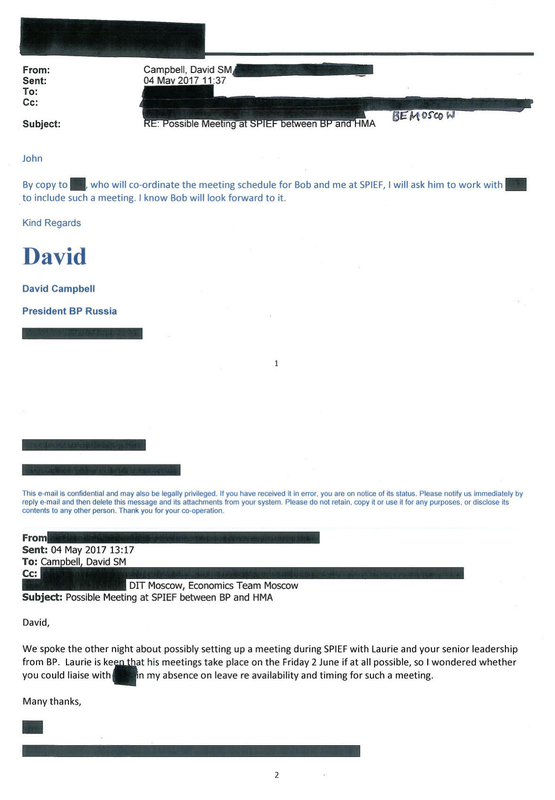 While these meeting notes are heavily redacted, they reveal that in Russia, BP was ‘actively trying to resolve a UK licensing application issues’ and that BP was in ‘close touch with BEIS [Department for Business, Energy and Industrial Strategy] and IEU [BEIS’s ‘International Energy Unit’]. This likely refers to BP’s plans to drill the ‘Domanik’ limestone formation. US and EU sanctions, introduced in response to the Russian annexation of Crimea, have partly been designed to prevent Western firms investing in unconventional extraction techniques, such as fracking, in Russia. For example, the EU ruled against cooperation to extract oil ‘located in shale formations by way of hydraulic fracturing’. However, BP and Statoil partnered with Rosneft to drill below the Domanik shale formation in order to reach the limestone formation – exploiting a gap in the sanctions. But the distinction is subtle. After sanctions were imposed in 2014, Statoil updated its press releases relating to the project to use the term ‘limestone’ where they had originally referred to ‘shale’. In August 2017, Reuters reported that BP was awaiting approval from the British government to start work on the project. Peter Mather also provides an update on the development of the ‘Southern Gas Corridor‘, a mega-pipeline designed to bring gas extracted by BP and its partners in the Caspian Sea to Europe. Paradoxically, the pipeline has been promoted to investors as a solution to European dependency on Russian gas despite BP’s plans to expand into the Russian gas sector in collaboration with Rosneft. At one time, concerns had been raised that new US sanctions could impact the project as the consortium behind the pipeline – led by BP – also includes Russian company, Lukoil. Given this meeting happened a few days after the US sanctions bill was announced, it’s likely this was on the agenda but any potential discussion of lobbying to influence US sanctions has been redacted. For further details, see ’30th May 2017′. For further details on the Royal Opera House’s website, click here and to find out more about the Royal Opera House, its sponsorship deal with BP and the musicians opposed to the partnership, click here. For full details of the lecture, click here.